Ephemeral Monument is a participatory installation, performance and single-channel video by Gita Hashemi focusing on key texts from the Iranian underground literature during the 1960s and 1970s. The piece responds to the history of thought and activism that led to the 1979 Iranian Revolution and traces the revolution’s aftermaths. In Ephemeral Monument, I write in chalk, erase and re-write selections from some of the texts that emerged from and influenced the political, the poetic and the personal dimensions of the opposition to the Pahlavi Monarchy and the formation of emancipatory ideas, rhetoric and actions amongst two generations of students, intellectuals and activists in Iran in the years leading to the 1979 Revolution. 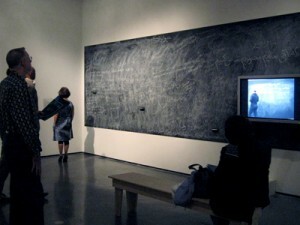 This performance is recorded on video and installed as a single channel projection alongside the chalkboard. The final layer of writing that remains on the chalkboard includes names of dissidents, activists and ordinary people who have been killed in Iran since 1979 in wave after wave of repression. 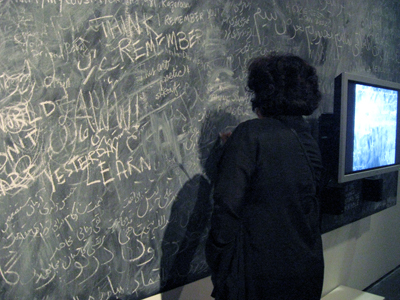 The names are collected through a call to the diasporic Iranian community and partly written by the audience as the chalkboard is left open for the audience to interact with for the duration of the exhibition. Writing in chalk is a return to my first public medium as a writer, a calligrapher and an agitator; a high school student who stole rare unobserved moments to write provocative messages on her classroom’s chalkboard and who took her writing to the city walls during 1978-79 protests. Through the embodied processes of writing, erasing and re-writing, my engagement in present time with these formative texts of the past is an act of remembrance and homage to the collectivity that I was a part of; and, at once, a narrative of forced and voluntary departures from that collectivity as the writing traces the impact of crossing the historical axis. Ephemeral Monument was first staged at Yerba Buena Center for the Arts in San Francisco in June 2008 as part of Theory of Survival curated by Taraneh Hemami. It will be relaunched in March 2013, at A Space Gallery in Toronto, as part of the solo exhibition, Time Lapsed, 1-30 March 2013.